OWN Private POOL and GARDEN: Modern, open-plan 2 or 3-bedroom house with vaulted ceilings and huge outdoor decks in Arorangi, Rarotonga's sheltered west coast famed for its sunsets. Book 2-bedroom house for up to 4 people, NEW! optional 3rd bedroom garden suite making total 6 guests. Sparkling private pool within sunny, fully enclosed deck area flowing from shady front verandah, large flat lawn for games, 200m from the beach, so handy to everything on the main road: Mini Golf around the corner, town and markets, airport, great beaches, bustop at door for round-the-island bus service, bike and car hire 100 metres, several excellent restaurants within 5 mins walk, so close to white sand beaches on the sunset coast for the best weather on the island! Inside the house is open plan, light and airy, fully insect-screened; with spacious modern kitchen, dining and living room, TV with DVD player, two large bedrooms with with choice of super-king or 2 singles in each, double sofabed in living room. Extra double room makes an optional 3rd bdrm with ensuite (extra charge applies). Large lawn with gardens, fruit trees, spacious tiled verandahs front and back for outdoor living, gas BBQ, outdoor furniture and loungers. Enjoy breakfast on the tiled verandah with beautiful mountain views ... wander 50 metres along the beach for Sunset cocktails at Manuia Beach resort off in your own pool .. eat out or in, meal-making's a pleasure in the bright convenient kitchen, the choice is yours. Be as lazy as you like in paradise! Recent comments in our guestbook: "Paradise" -Robyn, Vic, Au; "Great house, location, weather food, absolute paradise!" - Maria, Wgtn NZ; "Beautiful home, island and great holiday" - Michelle Wgtn NZ; "Great home, fell in love every day, hope to return soon!" - Paolo, Wgtn, NZ; "An ideal place for a holiday, looking forward to the next visit.." Elisabeth, Auck, NZ ; "Beautiful whare, perfect for our family of five' look forward to returning again soon!" Hemi, B.O.P. NZ; "Fab house, great base for a wonderful holiday!" - Danny, Chch, NZ. No smoking, no parties and no noise please, after 11pm. We are a Kiwi couple with grandchildren aged from 3 to 16 and we have been coming to the Cook Islands on holiday for 25 years. In 2010 we able to buy our house and upgrade it to holiday rental standard, adding our own private pool and a third bedroom suite. We are based in Auckland but spend several weeks in Raro each year, and we continue to make improvements to the house and garden, knowing that what we enjoy so much, others will too! 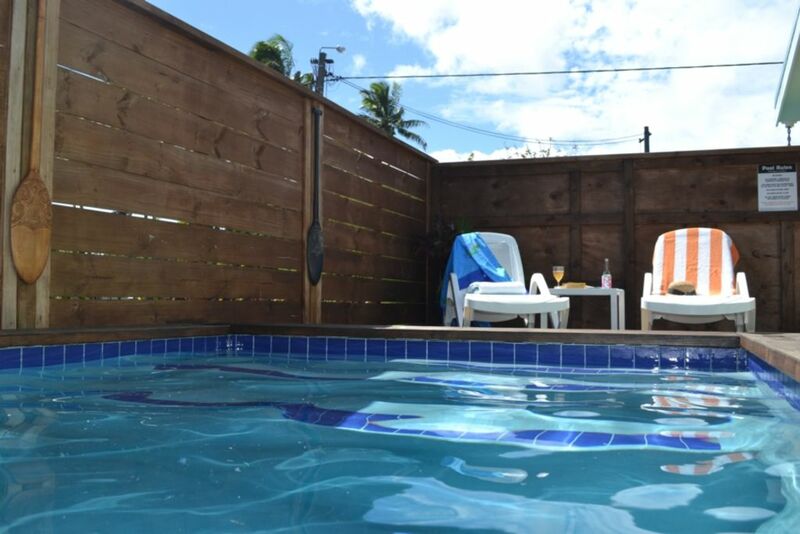 After so many years holidaying I many different properties, we knew what would make Raro perfect for us and this house, Pacific Time, is it. We have the best of all worlds here... best weather on the island, wonderful sunsets and we are spoilt for choice when in comes to Happy Hour beach bars and restaurants close by, yet we have a lovely spacious kitchen, BBQ, loads of outdoor seating to cater for ourselves right here at home. Just a few metres walk down to white sand beach and the lagoon encircled by the reef and wide blue ocean beyond. Pre-pay Wifi Hotspot in house. Open-plan, generous bench tops, plenty of cupboards and pantry cupboard. Indoor dining seats 6. Outdoors - two areas, front deck seating for 8, rear deck, seating for 4. Several DVD's including children's as well as G films. Big flat lawn surrounded by tropical gardens, passionfruit vines, pawpaw, bananas, limes, oranges. Generous decks run the length of the house front and back. Plenty of seating, lounge and loungers. Can be locked up, access from front deck, very private, loungers. The house was awesome- everything you would want. The pool was great and enjoyed by all. Great handy location. The house location is on a busy street but yet convenient with stores close-by. The house location is on a busy street but yet convenient with stores close-by. Our first impression is that the house is very homely. We enjoyed the 1st season of Modern Family with the DVD player in the house. There is a beach access through the road next to the house. The beach is not as great as the other part of the island but worth checking out. We enjoyed the pool and it is a nice touch with the house. The papayas and passion fruits were great and we are luck to tried them. Great home, lovely large outdoor areas, great pool, clean, well stocked kitchen, insect screens were brilliant - no bugs inside at all. Puna was lovely and very helpful. Beds - EXCELLENT, big and comfy. Fruit trees in the garden a wonderful touch. Close to beach and town. Felt very much at home, would love to go back - thanks Gabrielle and Paul for sharing your home with us. Harry, Toni, Ethan and Holly. PS: Gabrielle - your paintings were lovely. So pleased you enjoyed the place as we always do... thanks very much for the feedback. The house was as expected and would definitely stay again. The house was as expected and would definitely stay again. The additional outdoor furniture is a bonus as well as the pool. Grass area suitable for the kids to play and the house is bascially "bug free". Thank you Gabrielle! Fantastic house with everything you need. Fantastic house with everything you need. One of the reasons we chose to stay here was the pool and it was fantastic! We couldn't get our kids out of it. And an added bonus is that it is saltwater not chlorine. Gorgeous view of the mountain from the front patio. We felt very much at home. The house was perfect! Everything we needed was there. The house was perfect! Everything we needed was there. We were quite busy during the day and to come home to the home and the swimming pool was the topper! The best location in Rarotonga - wonderful base to explore from - and handy to town, airport, close by lagoon and beaches and a stroll to several fine restaurants and beach bars. Mini golf and local shops and fruit stands within a couple minutes walk.